Since 2003, I have taken an embarrassingly large number of photos of Near Southeast DC, capturing what the streets looked like just before the area's redevelopment resulted in the demolition of more than 160 buildings. On my web site, you can dig through many of these images to watch the progression from rundown small businesses and public housing to new office and residential buildings and Nationals Park. But, if you're out walking around the neighborhood, maybe you just want to see the "befores" of where you're standing, since you're currently standing right in front of the "after." 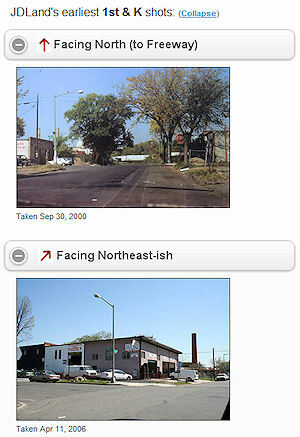 I've now created a couple of web pages for mobile access (using HTML5 and JQueryMobile) that access your phone's GPS signal to pinpoint what intersection you're standing at, and automatically retrieve for you the oldest of my "before" photos of that spot. They are marked with the direction I was facing when I took them, so you can turn clockwise and look at shots at up to 8 different spots on the compass. If you're not quite at an intersection, or if you're close to more than one location, you'll be given the choice of the nearest spots to look at (see below left). 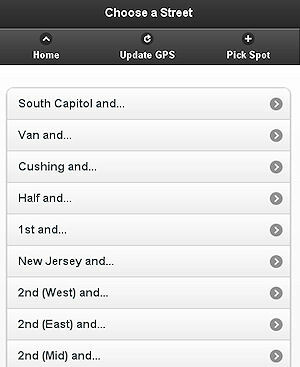 You can also browse through the more than 80 intersections covered (see below right), if your phone's GPS isn't pinpointing your location with enough accuracy or if you just want to wander through the photos manually. Go to jdland.com/here, or follow the link for "What Did an Intersection Look Like 'Before'?" 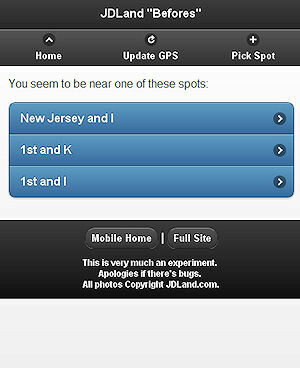 from the Mobile JDLand home page (m.jdland.com) to give it a shot. How does this work? I spent a little time with Google Maps getting the latitude and longitude of every intersection in the neighborhood, and put that into a database. It then takes your GPS-determined lat/long coordinates and looks for the closest intersection in the database, and, if there's a match, then returns the oldest photos in my image database from that location. If you're not right at an intersection, but the query determines you're relatively close to one or more, it will let you choose which one to view. Note: This is my first foray into mobile development on this scale (as well as my first attempt to use GPS data), so apologies if it's not particularly slick, or if you run into bugs. I'll be continuing to tinker with it, and to think about how to get the photos in front of people who are in the area. But it's a start.